Great product and great company to do business with. Very friendly customer support. I love promoting my company is an eco-friendly way yet super efficient way. Thanks for making that possible Custom Earth Promos. Eco-friendly products are the best. Always good to go green. I appreciate Custom Earth Promos greatly. Big shout out to Custom Earth Promos for being the best in the business. never had a single complaint about them since I started using them 4 years ago. 5/5 star review. My firm wanted to send all our clients thank you cards over the holidays. We customized these seed paper cards and they were a great success. I wanted direct our company in a more "green" direction, so we started buying these as thank you cards for our clients. The positive feedback we receive is outstanding! This product is truly amazing. Seed paper that grows into flowers? What will they think of next! Love these circle folding cards! Great company! I'm committed to supporting our environment in every way possible, I can promote my company in the best way. Thanks again Custom Earth Promos. Our company fell in love with the look of these seed paper cards and the premise behind them. My company promotes "Going Green" big time. 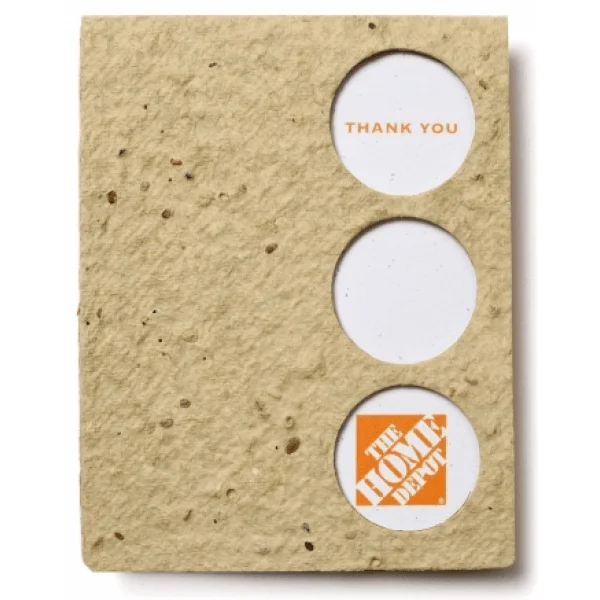 So it was a no-brainer to go with these seed paper cards when thanking all of our clientele. Beautiful cards that really stand out, our clients loved them. Environmentally sound way to say thank you. These seed paper cards look amazing in hand. I am very impressed. The design behind these cards is unique and I like that they are eco-friendly as well. Customizing these seed paper cards was a really great experience. Constructed the seed paper cards for all our employees. A great way to say thank you for all your hard work. Its a plus that they are eco-friendly too. 3 Die-Cut Circles on Front of Seed Paper Card Reveals Cardstock Graphic in "Window"
Seed Paper Circle Folding Cards combine two eco-friendly components with an essence of origami for a bold and geometric look. 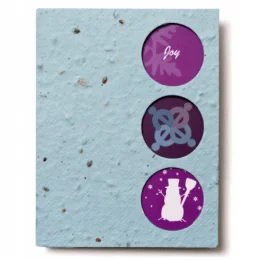 The seed paper jackets are precision-cut with circular placeholders to strategically display the 100% recycled cardstock inserts. Custom Earth Promos' seed paper folding cards can be designed to open vertically (4" W x 5.25" H) or horizontally (5.25" W x 4" H), depending on your graphic layout imprint requirements and personal preference for card appearance. A wide range of personalization options makes these ready-to-plant folding cards an effective and affordable advertising tool for brands of virtually any industry. In their eco-responsible design of 100% post-consumer recycled paper, 100% recycled cardstock and 100% recycled envelope, seed paper folding cards strongly communicate your brand's ecological investment and sustainability stewardship to customers and prospects. Eco-friendly products and practices of sustainability are currently shining at the center of an evolutionary market research spotlight. Consumers around the world report a great surge in expectation for brands to not only establish social and ecological responsibility, but also an effective communication of that venture and visible actions of merit. Brands must take a proactive approach to meet this increasingly vital consumer demand with "going green" initiatives, production methods of sustainability, waste reduction practices, and actions of ecological investment. Celebrate Earth Day with a ready-to-plant folding seed paper card handout. 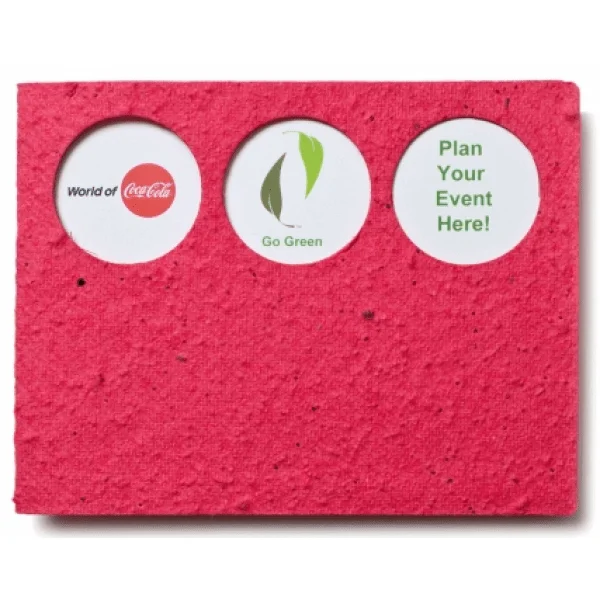 Your planet friendly promotion will flourish into a beautiful and beneficial addition to the ecosystem, establish the eco-responsibility of your brand and bring joy to your customers every day. 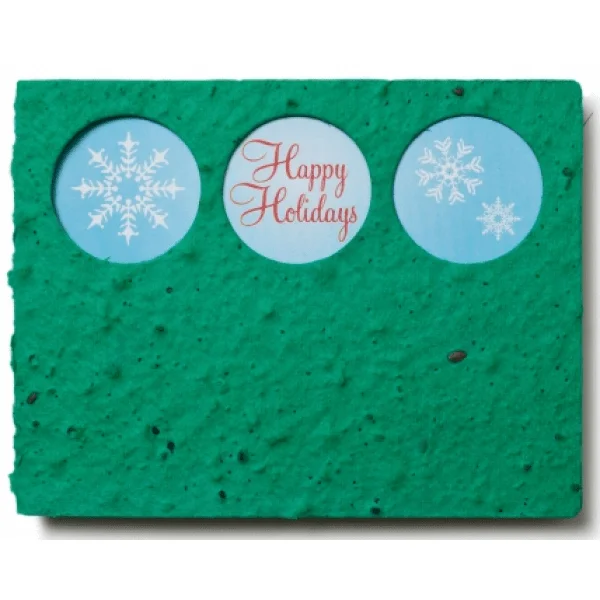 By sending your exclusively designed Seed Paper Circle Folding Cards as incentive gifts, to celebrate an upcoming holiday, announce a company-wide "going green" initiative or product line, your brand succeeds in acknowledging and meeting this consumer expectation of environmental awareness and ecological investment. Eco-friendly brand associations are proven to help retain current customers, attract new customers, gain market share and increase long-term profitability. 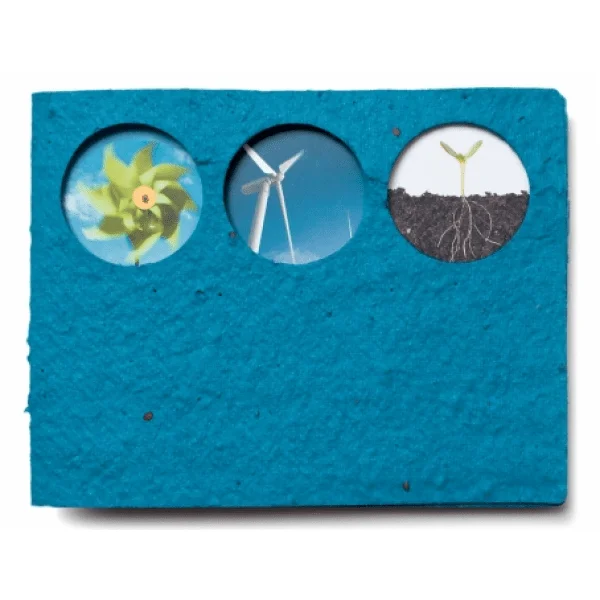 The best in the industry, Custom Earth Promos' seed paper is handmade in the USA at a 30kW solar-powered facility that eliminates eco-impact by infusing 100% post-consumer recycled paper with our hardiest annual and perennial wildflower mix. Undyed, 100% post-consumer recycled paper is used to create a pulp that is then infused with our highest germination rate, USDA-approved, non-GMO wildflower seeds. When seed paper is colored, the process includes a spraying process which guarantees quality coverage and vibrant appearance while minimizing any pressure on seeds and ensuring no loss of seed germination. All 21 of our seed paper color options are 100% natural, soy-based pigments. Whether designed to open vertically or horizontally, the seed paper folding card jackets will showcase 3 circular die-cuts on the front and back sides of the card. These circular cut out windows reveal carefully positioned graphic imprints on the recycled cardboard inserts, displayed within the seed paper die-cut circles. When vertically open, 3 die-cut "windows" will align vertically along the right side of the folding card. When cards are designed to be horizontally open, 3 die-cut "windows" will align horizontally along the top of the card. Die-cuts on the rear side of the folding card create a mirrored presentation of the folding card front, where cardstock insert is revealed in 3 circular windows. To ensure a final product design blueprint is a perfectly accurate, effective and eco-responsible representation of your brand, we invite you to work directly with one of our in-house design experts to determine which colors, graphics and layout options will best reflect your brand's core ideals. We can even customize the die-cut circle placement to display the circles near the folded edge or the outer edge of the card to achieve optimal exposure.